Unity Dashboard is an essential tool for providing real-time visibility of inbound and outbound activity as well as queue conditions across all Call Centres. Suitable for Call Centres of any size, Unity Dashboard provides the flexibility to display your key call handling metrics. As a completely configurable application, Unity Dashboard can display any number of queues and statistics giving you total control. Configurable parameters, with a clean and elegant interface, allows users to quickly understand the condition of the Call Centres quickly so that they can act accordingly. Thresholds & Alerts – All queue and agent statistics can be configured with a wide range of colour based alerts, graphically highlighting any problems that require immediate attention. Agent Gamification – Encourage self-management and competition among agents by using Dashboard as a leader board, e.g. show the top 5 agents based on total calls answered. Configurable Statistics – Configure over 47 essential and desirable statistics to highlight metrics that are important to you. Queue Statistics – Include: Inbound calls, outbound calls, answered calls, calls in queue, average abandoned time, overflowed calls, staff ratio, service level and agents available. Agent Statistics – Include: ACD state, total call duration, outbound total calls, transferred calls, idle time and many more. 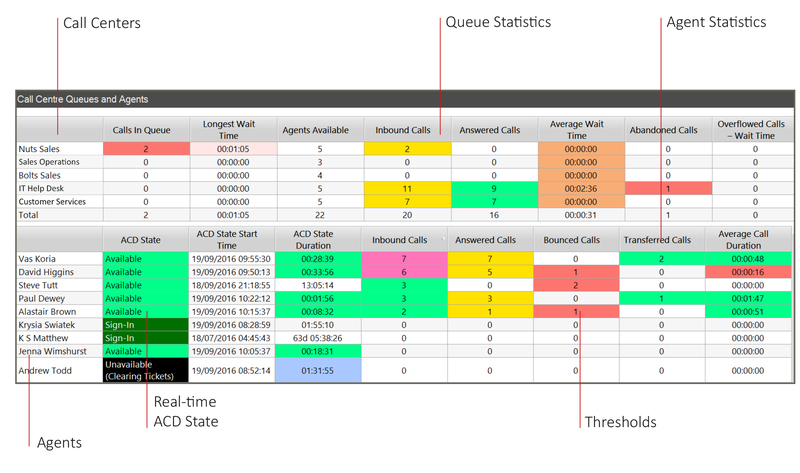 Key ACD State – See essential statistics such as Calls in Queue, Longest Wait Time, Overflowed and Abandoned Calls as well as agents current ACD state. Scrolling Views – Scrolling allows Dashboard to display a variety of statistics and queues for even the busiest ACD environments.